A man sorts lobsters at Ready Seafood on Thursday April 28, 2016, in Portland, Maine. The lobster company is slated to be bought by a Canadian company within the next four weeks. Canadian specialty foods company Premium Brands Holdings Corp. of Vancouver plans to buy Portland-based seafood dealer Ready Seafood Co. The Canadian company announced the definitive purchase agreement Tuesday morning. The deal is expected to close within the next four weeks, pending regulatory and other approvals. Ready Seafood, started in 2004 by brothers John and Brendan Ready, distributes and markets lobsters. It has three production facilities, all in Maine. It also plans to build one of the largest lobster processing facilities in the country in Saco. 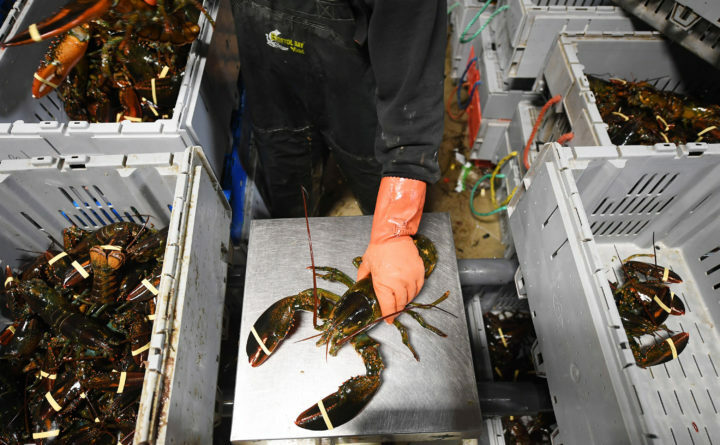 While Maine fishermen catch more lobsters than elsewhere in the United States, the state lacks processing facilities for their meat. Ironically, Americans typically ship millions of pounds of lobster to Canada for processing each year. When the acquisition closes, Premium said it expects the addition of Ready to bring its sales to close to $304 million. The company said it plans to expand its operations across Canada and into the U.S. east coast. Ready has more than $100 million in annual sales. “With Premium Brands as our long-term partner we look forward to accelerating our growth,” Brendan Ready said in a prepared statement. Neither he nor his brother John were immediately available for comment about the potential effects of the purchase on the new processing facility or the number of employees in Maine.